A hiatal hernia occurs when part of your stomach pushes upward through your diaphragm. A small hiatal hernia may not cause any problems. However, a large hiatal hernia can cause food and acid to back up into the esophagus causing heartburn. Sometimes larger hiatal hernias may require surgery. This can now be done laparoscopically and you generally go home the same day. Incisional hernia repair is a surgical procedure performed to correct an incisional hernia. An incisional hernia, also called a ventral hernia, is a bulge or protrusion that occurs near or directly along a prior abdominal surgical incision. The surgical repair procedure is also known as incisional or ventral herniorrhaphy. Inguinal hernia repair is surgery to repair a hernia in the abdominal wall of your groin. A hernia is tissue that bulges out of a weak spot in the abdominal wall. Your intestines may bulge out through this weakened area. Umbilical hernia can also be repaired using a laparoscope, a thin, lighted tube that lets the doctor see inside your belly. The laparoscope will be inserted through one of the cuts and instruments will be inserted through the other cuts. 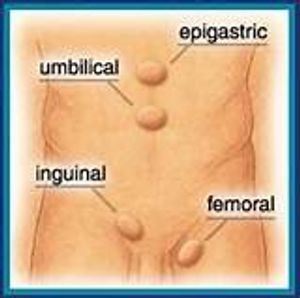 Ventral hernias come by different names and appear for different reasons. But they may be called umbilical hernias (around the belly button), Epigastric hernias (up near the ribs), stomal hernias (around stomas), or the most common, incisional hernia (anywhere through a previous surgery scar).